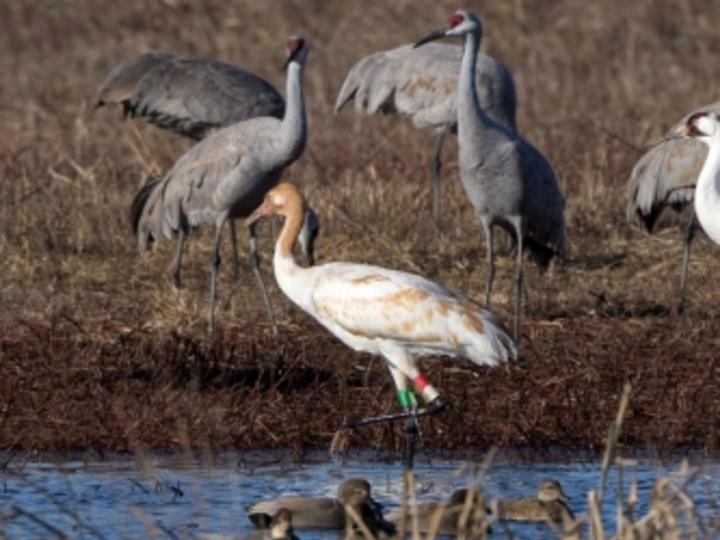 Decatur, Ala. – Over 14,000 Sandhill Cranes along with several pairs of Whooping Cranes spend the winter each year at Wheeler National Wildlife Refuge. In celebration of these long-legged and long-necked birds, Wheeler Wildlife Refuge Association hosts a two day event filled with nature walks, concerts and special programs for experienced birders and anyone who would like to learn more about birding and other wildlife that call the Refuge home. Set for January 13-14, 2018, Festival of the Cranes takes place at Wheeler National Wildlife Refuge in Decatur, Ala.
Now in its fifth year, Festival of the Cranes has become a popular weekend activity for families near and far. The event kicks off bright and early Saturday, January 13 at 6:30 a.m. with a breakfast in the Visitor Center classroom and an early morning birding walk to see cranes and other waterfowl arrive in the fields. Cost is $5 per person. A variety of activities and educational opportunities are lined up throughout the day at the Refuge including Birding 101 course, a photography workshop, a special presentation by acclaimed author, storyteller, and naturalist Brian “Fox” Ellis, a nature hike, a free concert by flutist Michael Graham Allen and special activities for children to take part in. The lineup for Sunday, January 14 includes another Birding 101 course, live music, special activities for children and festival goers can choose from a photography workshop hosted by David Akoubian or the Comic Mis-Adventures of Lewis and Clark with Brian “Fox” Ellis as Meriwether Lewis. At 1:30 p.m., Brian “Fox” Ellis steps into the shoes of Prince of Wied, Maximilian allowing the audience to step back in time. Blending history, science, art and cultural anthropology, the Prince gives us a unique view of America as he saw it in the early 1830s. New for 2018 is a change in venue for one of the crowd favorite activities. Due to the popularity of the raptor presentations and the limited seating and parking at the Refuge’s visitor center, the three Auburn University Southeastern Raptor Center presentations will take place at the historic Princess Theater in downtown Decatur. The new location will ensure everyone will have the opportunity to enjoy the wonderful entertaining and educational program. To make it even more convenient to enjoy all the events at Festival of the Cranes, a shuttle will be available to take festival goers to and from the Wheeler Visitor Center to the Princess Theater and other areas of historic downtown Decatur for a nominal fee. Show times are set for 11 a.m. and 1:30 p.m. on Saturday, January 13 and 1:30 p.m. on Sunday, January 14 and admission is free. The Wheeler National Wildlife Refuge Visitor Center is located at 3121 Visitor Center Road in Decatur. For more information on the Festival of the Cranes, visit https://www.fws.gov/refuge/wheeler/ or call Teresa Adams, supervisory ranger for Wheeler National Wildlife Refuge, at 256.350.6639 or call Decatur Morgan County Tourism at 256.350.2028 or 800.232.5449.